Last June was a triumphant moment for Frank W. Ballou Senior High School, a predominantly black school located in Southeast Washington, D.C. After years of dismal student test scores and graduation rates, Ballou made headlines that could make the school and its students proud: Their entire senior class had been accepted to college. It was the first class in Ballou history to have done so. But a new report from WAMU-TV and NPR has raised questions about Ballou administrators’ role in that achievement. An article published Monday found that the high school had graduated dozens of students who had missed an excessive amount of school. After a District of Columbia Public Schools employee sent reporters attendance records, class rosters and emails, WAMU and NPR found that over 50 percent of Ballou’s 164 graduates missed more than three months of school during their senior year. DCPS official policy requires that students fail a course if they miss a class 30 times. Yet 1 in 5 graduates were absent more than they were present (a feat that would require missing more than 90 days of classes). Reporters from WAMU and NPR spoke to “nearly a dozen” current and former teachers and some recent graduates for the piece, which has prompted an investigation from D.C. Mayor Muriel Bowser and D.C. Public Schools. Teachers told reporters that they face continuous pressure from Ballou administrators to pass their chronically absent and underperforming students. Many students would be in the building, they said, roaming the halls or hanging out in the school gym, but not actually in class. 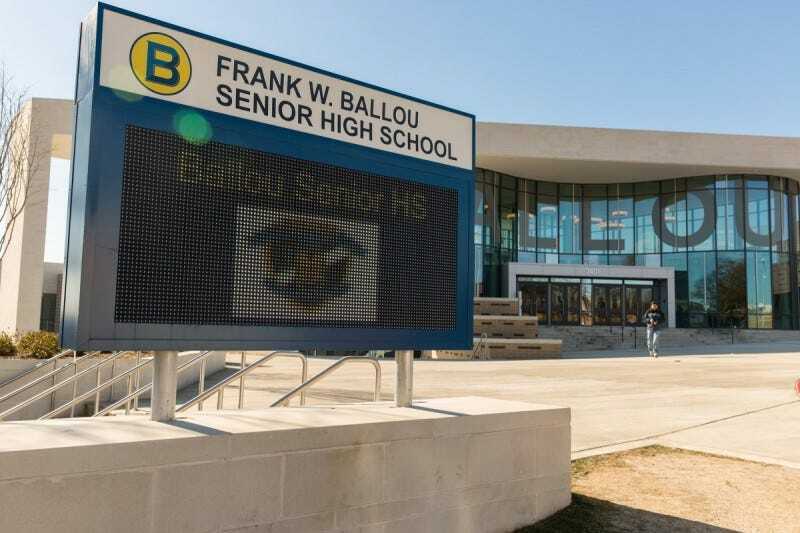 Recent Ballou students reported that they knew administrators wouldn’t let them fail. “You learn to work the system,” said one student who missed more than half of her senior year. She told WAMU that she only came to class when the school would threaten truancy court, and even then, she would only show up for a few hours to do her classwork, then leave. But this student was also dealing with serious issues—she says she wasn’t living at home at the time and was working a fast-food job so she could pay rent. Students also said the high teacher turnover—as an an earlier NPR piece from June noted, more than a quarter of Ballou’s teaching staff left during the course of the 2016-2017 school year—made it harder to stay committed and focused on their schoolwork. DCPS has come under national scrutiny recently following another series of stories featured on NPR’s Code Switch that profiled Ron Brown College Preparatory School. Teachers at that school had taken issue with DCPS policies they felt were overly lenient. But administrators pointed out that the best way for school staff to help students was to keep them in school—once a student drops out (which is more likely if they’re failing classes, or have to repeat a grade), they’re out of the school’s reach. Data shows that the costs of dropping out are high: A HuffPost article from 2014 notes that half of all Americans receiving public assistance are dropouts, as are more than 80 percent of those incarcerated. Black men are disproportionately affected. As the article notes, black male high school dropouts made up 22 percent of America’s prison population when the article was published. Still, Ballou graduates say that their first taste of college has been a slap in the face and say that they’re struggling in some of their classes. It’s unclear how many of Ballou’s grads enrolled in college after their acceptance—those numbers will be available in May 2018, DCPS says. D.C. council member David Grosso released a statement expressing disappointment in the WAMU-NPR report’s findings.